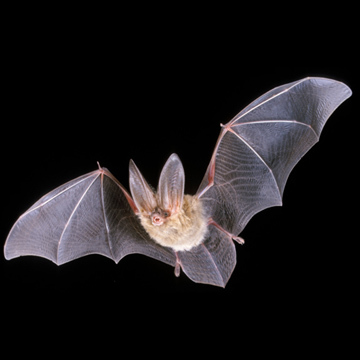 Description: The most distinctive feature of the Townsend’s Big-Eared Bat (Corynorhinus townsendii) is it large ears, which are more than 2.5 cm in length. Its fur ranges from pale to dark brown. Females are usually larger than males. They are an average of 98mm in length an weigh around 7-12 grams. About the Townsend’s Big-Eared Bat: This bat roosts mainly in caves and mines, not in crevices but hanging from the ceilings. They have also been found in buildings. They hibernate in the winter but have been known to come out of hibernation during this time. Males live relativity alone (1-7 individuals) while females live in maternity colonies and birth one pup.